Transcript, photo, and additional notes follow below. From the Cumberland Gap to the Atlantic Ocean, this is Virginia Water Radio for the week of December 8, 2014. WATER SOUNDS MIX – 5 sec. This cacophony of water-related sounds—streams, crowds, frogs, and more besides—symbolizes the complexity of sustainably using water resources in Virginia, the United States, and the world. How does society sort out this complexity and make informed choices about water? One brand-new, pioneering way begins in 2015 at Virginia Tech: a new water resources degree for undergraduate students. And to tell you more about it, here’s guest host Eli Archer, a junior in Geography at Tech. The new Bachelors of Science degree, called “Water: Resources, Policy, and Management,” gained formal approval in November 2014 from the State Council on Higher Education in Virginia. This comprehensive, interdisciplinary degree is the first of its kind at the undergraduate level in the United States. The new degree’s development began in 2011, and took place in concert with Tech’s hiring of seven new water-resources faculty members. The degree’s academic home will be Tech’s Department of Forest Resources and Environmental Conservation, in the College of Natural Resources and Environment. Four other Virginia Tech colleges are also involved: Agriculture and Life Sciences, Architecture and Urban Studies, Engineering, and Science. Here are some of the new degree’s main subject areas, voiced by several Virginia Tech faculty in colleges participating in the major: hydrology; watershed management; water quality; aquatic ecosystems; law and policy; public health; international water management; climate, energy, and food. Incorporating this diverse range of topics, the new degree aims to help society tackle water’s complexity by helping a new generation of college students develop skills and knowledge about water resources, its many uses, and its many users. For more information on the new undergraduate water resources degree, phone the Virginia Water Resources Research Center at (540) 231-5624. 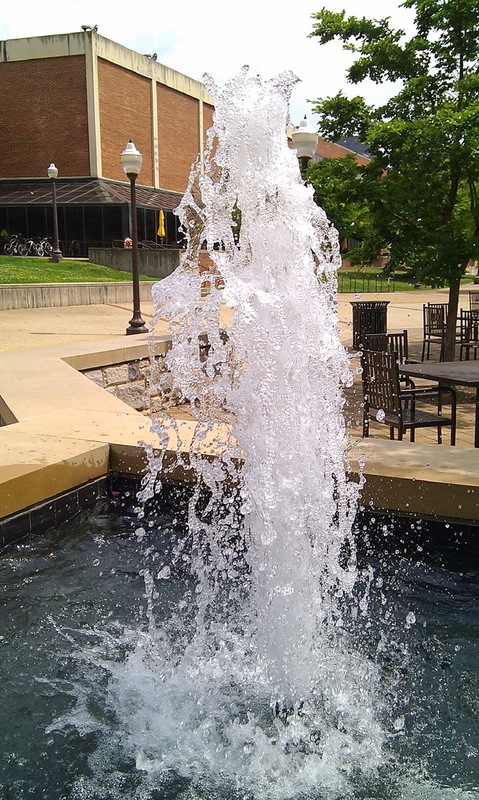 Requiring a water source, energy, infrastructure, and money, this fountain on the Virginia Tech campus in June 2013 represents some of the many, inter-connected aspects of water that—starting in 2015—will be getting attention from students in the university’s undergraduate degree, Water: Resources, Policy, and Management. The water-sounds cacophony consisted of a flowing stream, Chesapeake Bay waves, a thunderstorm, Little Blue Herons, Red-winged Blackbirds, Spring Peeper frogs, a household water faucet, crowd noise, and a motorboat. The Little Blue Heron and Red-winged Blackbird sounds were taken from the U.S. Fish and Wildlife Service’s National Digital Library, online at http://digitalmedia.fws.gov/; all other sounds recorded by Virginia Water Radio. Venkat Sridhar, Dept. of Biological Systems Engineering/College of Agriculture and Life Sciences. Information for this episode was taken from Virginia Tech Department of Forest Resources and Environmental Conservation’s Web site for the new undergraduate water resources major, “Water: Resources, Policy, and Management,” online at http://waterdegree.frec.vt.edu/. More information on recent water-education developments at Virginia Tech and at the Virginia Water Resources Research Center is available in the November 2014 issue of the Water Center’s newsletter, Virginia Water Central, available online at http://www.vwrrc.vt.edu/water-central-news/; see pp. 34-35. Lists of the water-related courses at Virginia Tech (one list for undergraduate-level courses and one for graduate-level courses) are available on the Water Resources Research Center's Web site, at http://www.vwrrc.vt.edu/water-courses-vt/. This episode may help with Science Standards of Learning (SOLs) in Earth Science (ES.6 and ES.8) and in Biology (BIO.8).